Through AD Console, its administrator can perform multiple tasks right from a single panel. It is possible to perform numerous operations such as; create a new user or organizational unit, delete user, modify user attributes, move AD user to another OU; and if required; undo all the changes using rollback options. Apart from this, the software allows to find/add/update/remove Organizational Units (OU) related to AD objects. In order to open and view the list of users within your Active Directory, the SysTools AD management platform needs Admin credentials. Once you login using AD administrator credentials i.e. username and password; the Active Directory Management tool will enlist users created with AD. The administrator can also export active directory OU users to CSV file. Rollback user option will be active once actions like; add, delete or edit user has been executed using AD Console software. This option will help users to reset all the changes and start afresh with the new. This option can be helpful if you have made any mistakes and want to start over again. Organization unit management is another feature of this active directory management console. With this, users can create organizational unit in AD, delete existing organization unit, rename organization unit and even move users from existing organization unit to other, by simply drag and drop method. You only need to click on the organization tab to perform these operations. The software allows mapping the CSV fields imported from external source with that of AD filed. It is possible to map CSV fields to AD field, once any of the modifications is done in the CSV file i.e. add, delete, modify or rename users. To make the setting, go to the settings tab on software home screen. This tool maintains action logs so that the management of the entire user properties is further possible with ease. User can save and store activity logs in the tool's Logs section; which gives out details of any action done using the software on Exchange Server machine. Also, export active directory users to CSV file from it for future use. 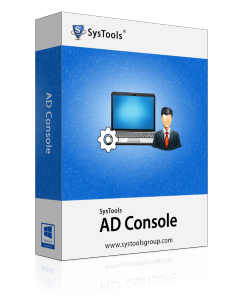 Demo/free version of AD Console software will be active without limitation in process execution for 6 days from download date. Can I use this utility to manage active directory from remote computer without Active Directory Server? No, active directory and Exchange Server should be active to manage active directory user accounts from the computer. How to create OU in active directory 2012? Go to the “Organization” tab. Select the desired location in tree view where you wish to add OU in active directory and click on "Create". Then enter the name of the OU which you want to create and click on “Submit”. How to move user account from one OU to another OU? For moving user to different OU, please follow the below given steps. Choose the organization unit which contains the users that you want to migrate/transfer. Then Drag the user profiles that you wish to migrate to that particular Organizational Unit. Click on "Yes" if you wish to move user to organizational unit in active directory. How to export active directory OU users to CSV file? Can I do this using this active directory management software? Yes, you can extract AD users to CSV using our product. Can I find and check OU in active directory? Yes, you can check and find organizational unit in active directory. I renamed a user in active directory and I misspelt it. Can I undo the attribute changes via your AD management tool? Yes, you can rollback active directory changes using our AD management console. Managing Users even after administrative rights was a bit complicated on Active Directory. Glad that there is a tool concerning the convenience of Administrators as well. Extremely pleased with the Roll Back changes options which is highly expected but was never possible. Thanks to SysTools, Administrator convenience is also given preference via the AD Console application. Managing an organizational level of users is quite difficult even for an administrator, thanks for making the procedure a bit managed and convenient for us! This is by far the best solution I have used to change user attributes in active directory. SysTools active directory management utility allows us to also rollback active directory changes that were done previously. Thanks for developing this gem for all the AD admins. The best product to monitor active directory user activity as well as update the user profiles on the single panel. This AD management tool makes all the admin tasks easy. It’s also reliable too. I am glad to have found this exceptional application. Kudos to SysTools team.